Access important information, connect with clients, and make big decisions on the move. We live in an increasingly fluid and interconnected world. Some say a 'mobile revolution' is underway, and the numbers back them up. The global usage of mobile devices is forecasted to reach 4.68 billion by 2019. For any sales team on the move, constant access to information has become a necessity. When you're on the field closing a sale, getting back to the office to update the progress of every meeting, event, or sales call isn't a viable option. The hassle a manager has to go through to track the activities of their reps can become a challenge of its own. 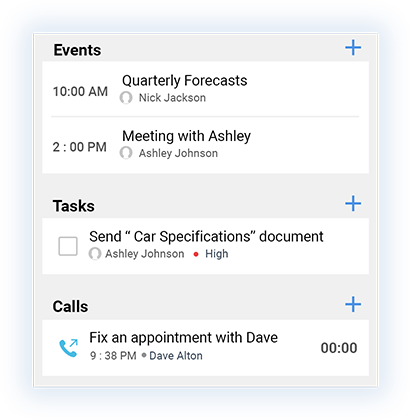 With a mobile CRM, you can easily stay in sync with any important information in real time from your smartphone. Let's take an in-depth look at the beneits of having a mobile CRM, and how it can help scale your business. 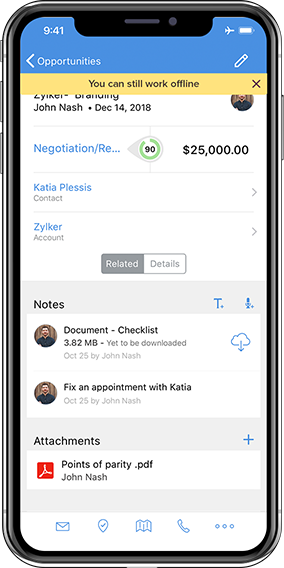 A mobile CRM provides constant access to customer interactions, contact history, recent transactions, and up-to-date pricing information. Having continuous, real-time access to customer data helps you prepare for meetings and follow-ups with leads while you're on the move. Spend less time tracking down customer information and more time closing deals. 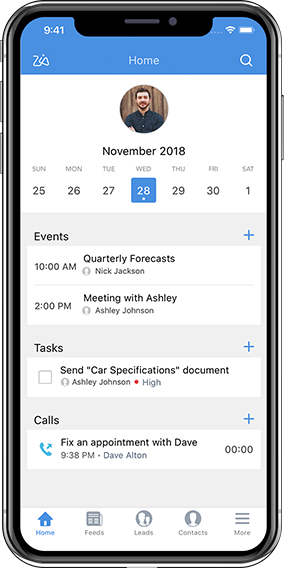 A mobile CRM keeps all your information handy so that you can invest your time anticipating your customers' needs instead of on redundant tasks. 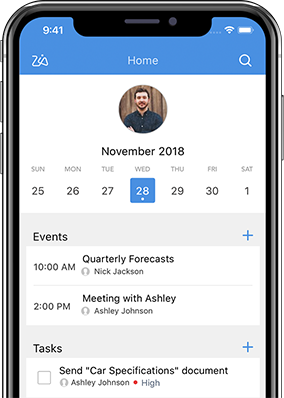 A mobile CRM not only benefits sales reps in the field, it also beneifts managers back at HQ who need to stay informed of their team's progress. 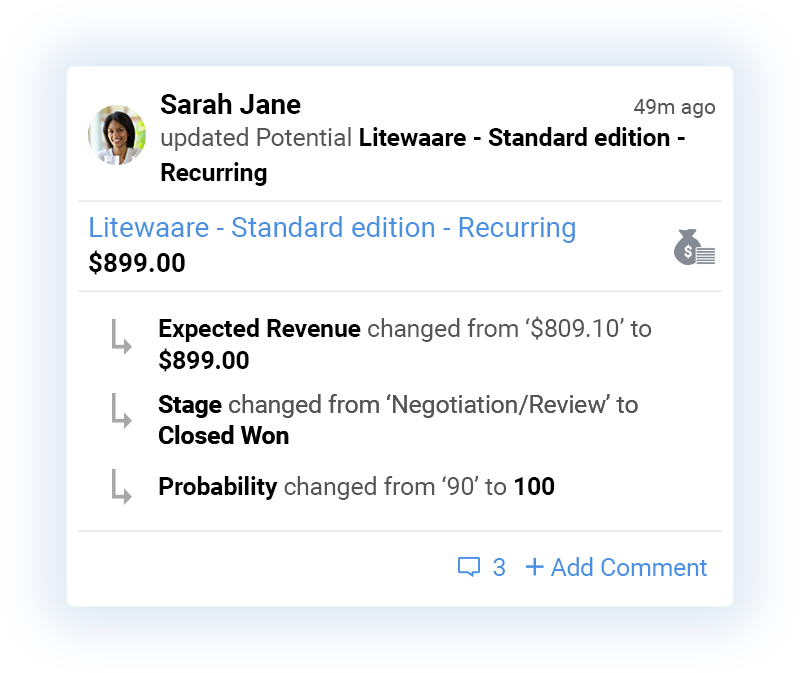 When managers can access your real-time sales reports, track your sales pipeline, and provide support while you're out and about, you can respond to potential challenges with complete confidence. Focus on building customer relationships by providing quality suggestions and answering customer concerns right away. Follow up after you've closed a deal and provide top-notch support. 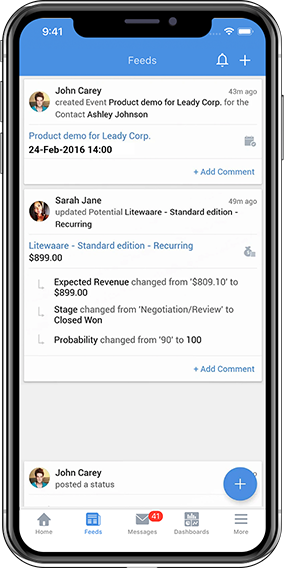 Check in at customer locations to record your visit and update your deal progress after every meeting. 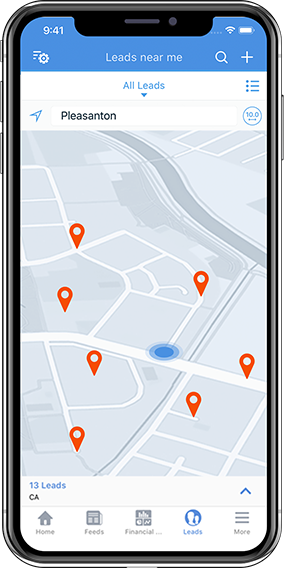 Plan smart and manage your time by geo-locating prospects nearby to schedule meetings efficiently. Stay on top of your game by reviewing notes, attachments, and deal details before you head out for important meetings. Access and modify your records even when you're offline and they will automatically sync when you're back online. Connect with your colleagues instantly, no matter where you are. Engage other team members by @mentioning them. Attach photos and files directly to your feeds for easier access. you can connect with your customers when you're on the move, and manage your end-to-end sales cycle. Easily digitize and save business cards to your phone whenever you attend meetings, conferences, events, or trade shows.